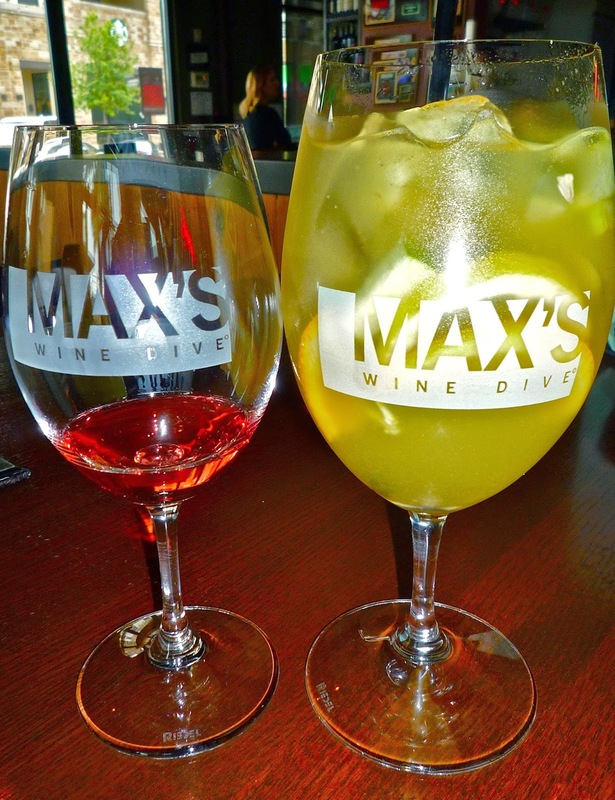 This month's featured restaurant for The Weekend Gourmet Dines Out is Max's Wine Dive, located across from The Quarry shopping complex in San Antonio. 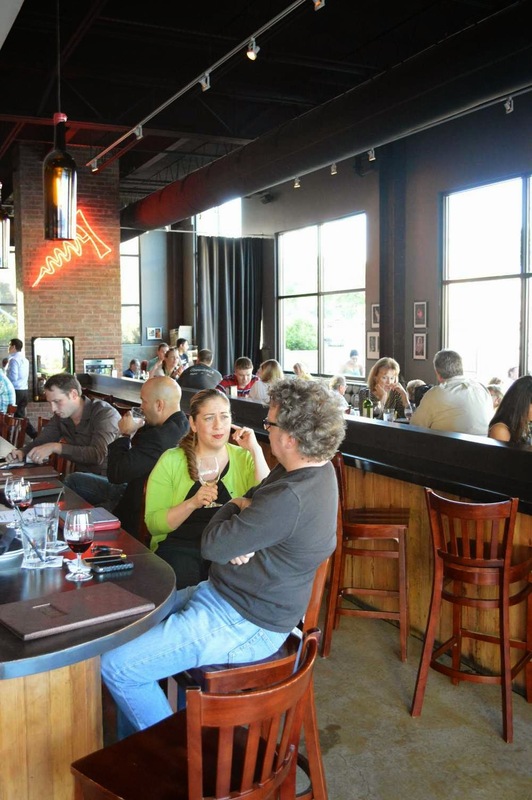 Featuring an extensive wine list and fabulous casual-elegant food, it's a fantastic place for a relaxing after-work Happy Hour or romantic dinner for two. Max's Wine Dive had me out for a dinner tasting of some of their signature menu items, as well as some of Executive Chef Justin Johnson's seasonal menu creations. My friend Julie from the wine blog Venue & Vine joined me to enjoy some great food...and sample several different wines. Great wine, delicious food, and fabulous company make for an excellent evening. We started out with a tasting of a few wines suggested by our server, along with a White Sangria for me. The sangria was fruity and not too sweet, and it paired perfectly with our duo of appetizers. Our first appetizer was the popular Pulled Pork Stuffed Peppers. One bite was all it took to understand its popularity! Smoky pulled pork and cotija cheese are stuffed into slightly sweet piquillo peppers. 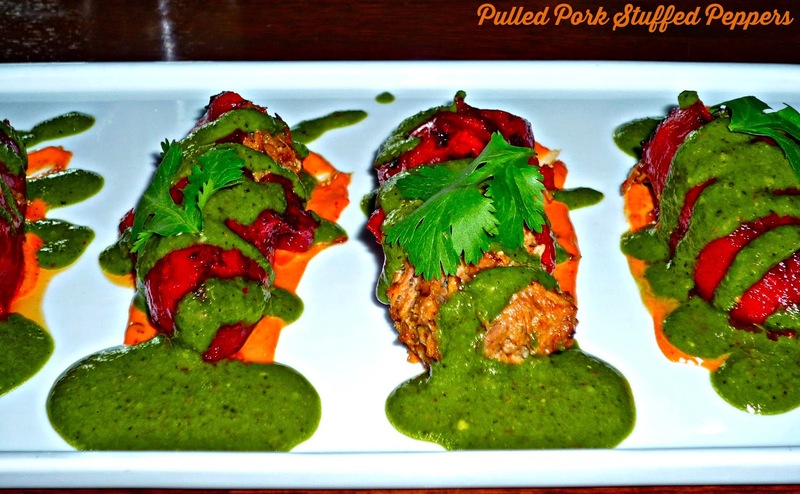 The peppers are served on a bed of spicy and smoky chipotle aioli and topped with cilantro chimichurri. This dish was bursting with the big flavors I crave, and it was gorgeous on the plate! We paired the stuffed peppers with another Tex-Mex inspired appetizer, this one from the seasonal menu. 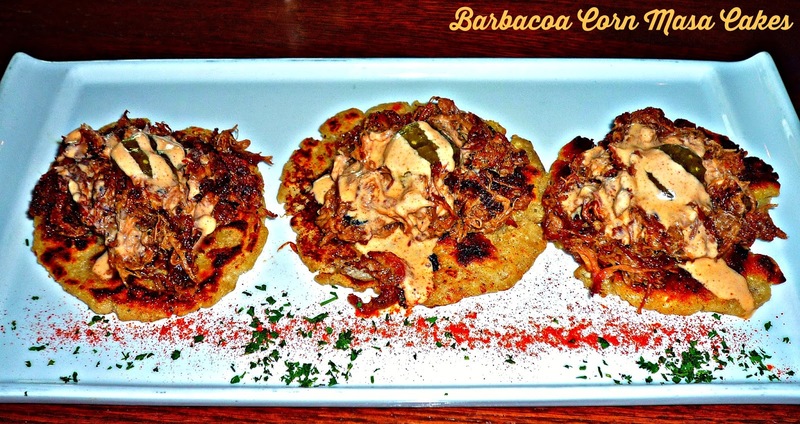 The Barbacoa Corn Masa Cakes featured crispy corn cakes topped with rich shredded beef and spicy ancho creme fraiche. They were savory, earthy, and delicious. Our meal was off to a fantastic start! We opted to share three entrees -- two from the traditional menu, and one from the seasonal offerings. As soon as I spotted Shrimp & Grits on the menu, I simply had to taste their version. 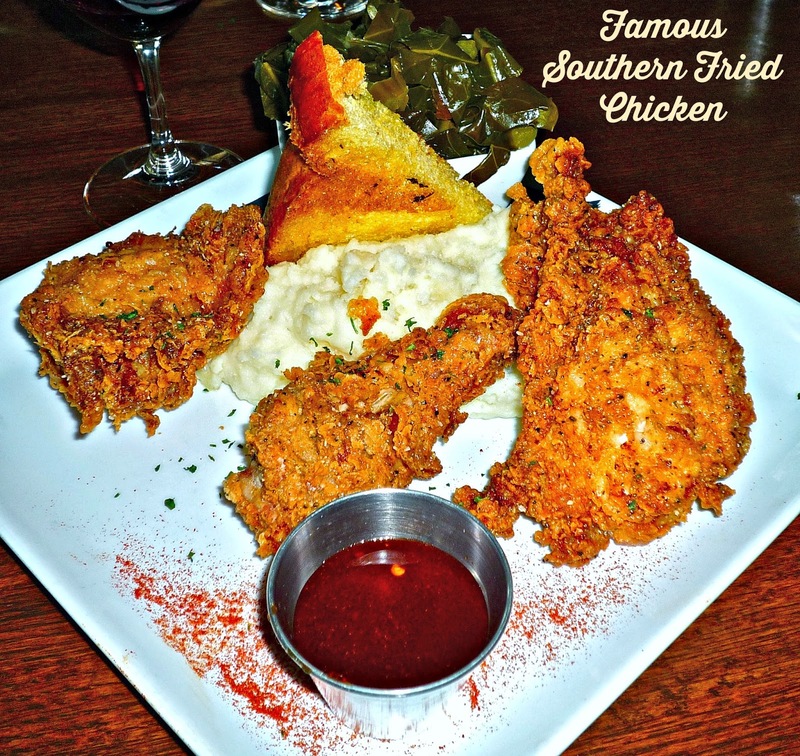 Their signature menu item is Famous Southern Fried Chicken, which is served with champagne. To quote their menu, "Why the hell not?!?!?" 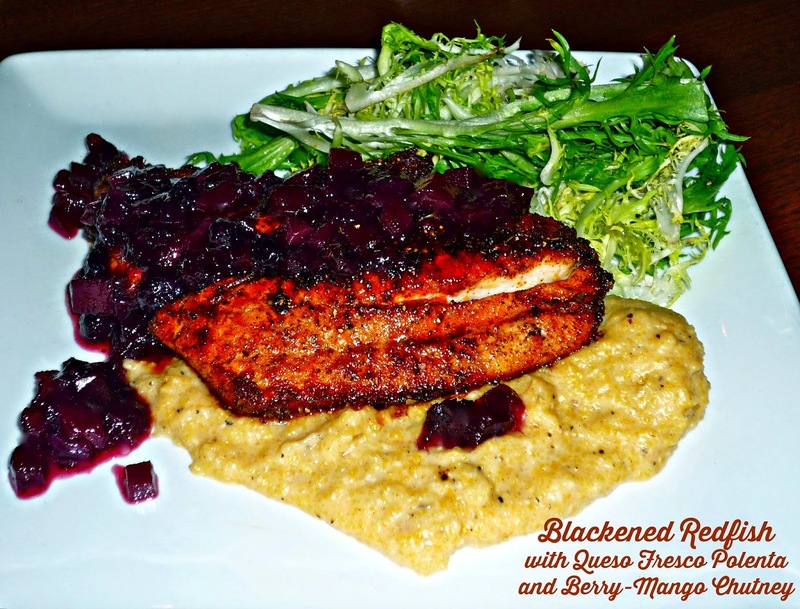 From the seasonal menu, we selected Blackened Redfish topped with a Berry-Mango Chutney. We sampled a few more wines while we waited for our entrees to arrive. Wowza! 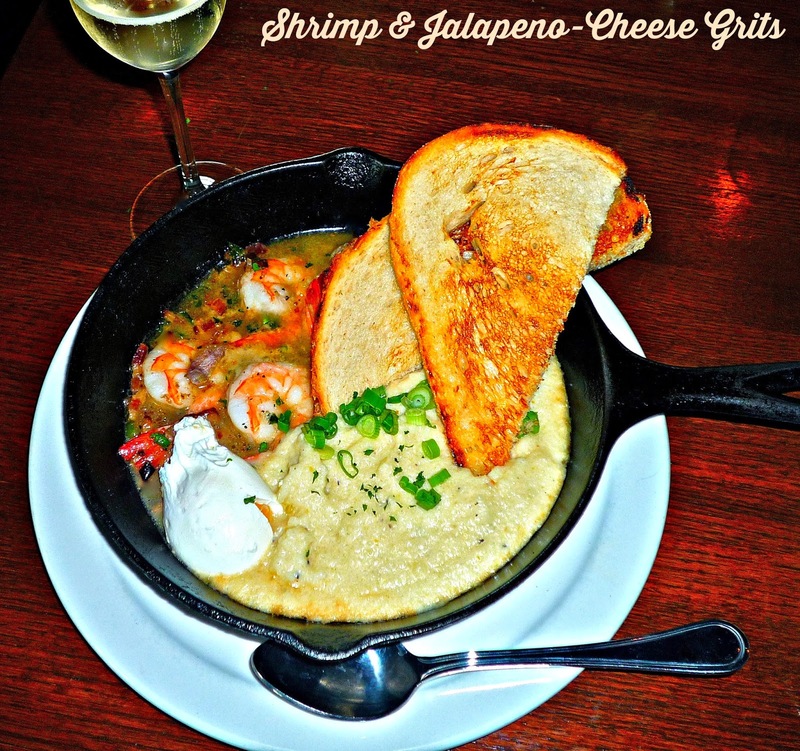 The Shrimp & Grits featured flavorful jalapeno-cheese grits, bacon, and a poached egg. It was a little spicy, a little earthy from the grits, a little sweet from the jumbo shrimp, with a little richness from the egg. So good! The fried chicken would do any Southern grandma proud. The chicken is marinated in buttermilk and jalapeno, then fried up golden and crisp. 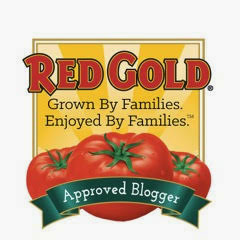 It's served with creamy mashed potatoes and collard greens. This is seriously some of the best fried chicken I've eaten at any restaurant -- juicy and flavored all the way to the bone. The champagne was a fun touch! The Blackened Redfish was spicy good, with a nice sweet touch from the berry-mango chutney on top. The base of queso fresco-infused polenta was rich and decadent. These three tastes and textures worked really nicely together. All three entrees were huge winners in our book! We were starting to get full, but out came two sweet dessert wines...and a duo of decadent desserts. For those who can't quite make up their mind, the Half & Half is the perfect compromise. 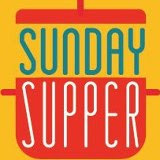 It features smaller portions of the Mint Chocolate Chip Brownie and the Apricot Pecan Bread Pudding. This duo is served side-by-side on a plate and topped with local Brindle's ice cream, caramel and fudge sauce. Both desserts were richly sweet, perfect for sharing. 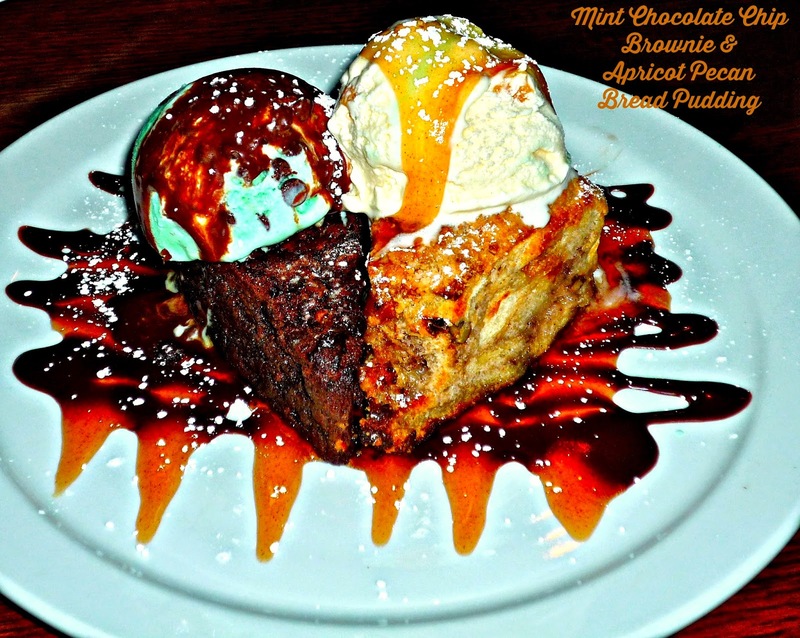 The brownie is fudgy and rich, topped with mint chocolate chip ice cream. 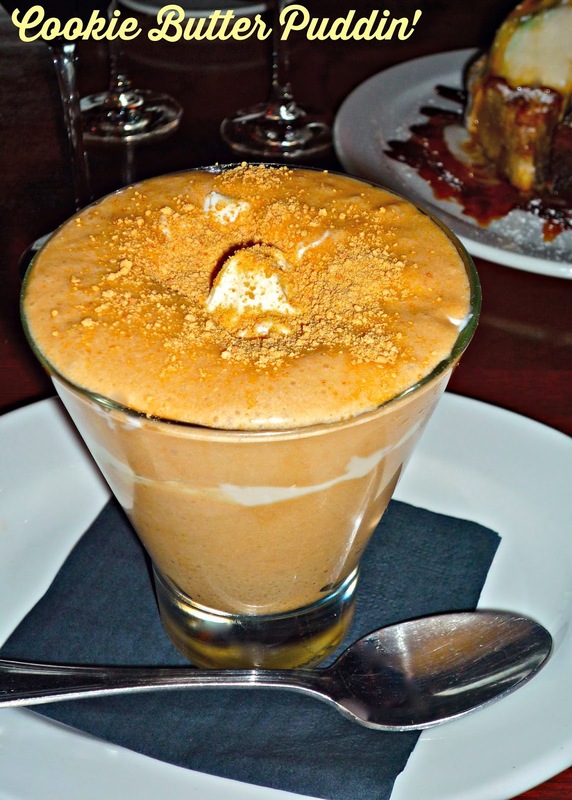 The bread pudding is moist and flavorful, topped with apricot bourbon ice cream. With this dessert, everyone at the table is guaranteed to be happy! Our other dessert was the over-the-top -- in a good way -- Cookie Butter Puddin'. If you love cookie butter spread as much as I do, you're sure to be a fan of this rich spin on a comfort classic. The pudding features mascarpone creme fraiche and graham cracker crumbs. This dessert reminds me of the comforting pudding that I remember from my childhood...amped up with the addition of one of the hottest food items of today! I absolutely loved this dessert. With that, our tasting was complete. I can honestly say that everything we tasted at Max's Wine Dive was expertly prepared and reasonably priced -- especially considering the portion size and the quality of ingredients. 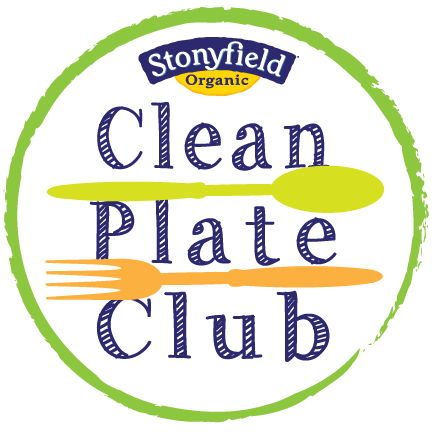 I can't wait to come back to sample more of the creative menu items! 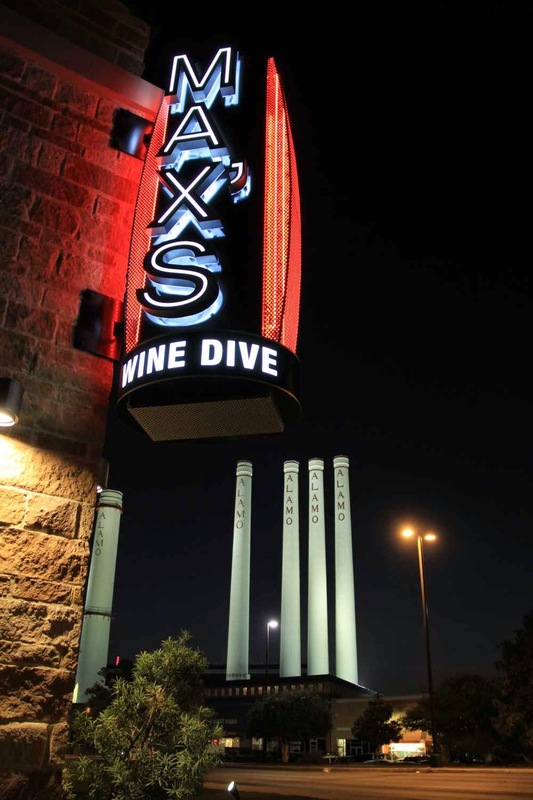 Max's Wine Dive currently has Texas locations in Austin, Houston, Dallas, and Forth Worth. For my readers who live outside of Texas, they're opening locations in Atlanta, Chicago, and Denver this year...so be on the lookout if you live in one of those cities. In addition to serving dinner nightly, the San Antonio location features a lively Happy Hour Monday through Friday, lunch on Fridays, and a popular weekend brunch that's available both Saturday and Sunday. Seating is available both outdoors and indoors. One more cool thing about Max's Wine Dive: if you try a wine and decide you love it, they'll sell you a bottle to take home with you. Julie enjoyed one of our dessert wines so much that she took a bottle home with her. How's that for being accommodating to your patrons? Disclosure: Max's Wine Dive provided me with a complimentary dinner tasting and wine samples to facilitate this feature. 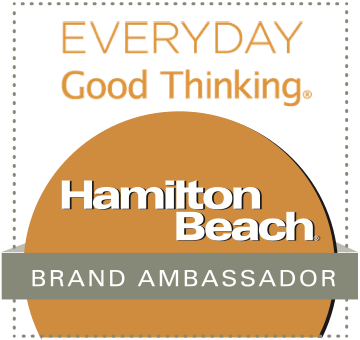 I received no other compensation, and all opinions expressed are solely my own.